ruime woning met omheinde tuin van 1000 m2, met directe toegang tot de zee, ideaal voor familievakanties, ook vrienden. Grote woonkamer met TV, 5 slaapkamers, 2 badkamers, 2 toiletten, keuken, oven, magnetron, vaatwasser, wasmachine, droger, Wifi. Buiten, tuinmeubelen, barbecue, tafel ping-pong. Om hygiënische Onze huisdieren zijn niet toegestaan. De huur moet zo schoon worden gemaakt als je bent aangekomen, anders worden schoonmaakkosten van 80 € gevraagd. 1 badkamer met douche. 1 badkamer met ligbad. Propriétaire très accueillant. Maison spacieuse et agréable, nous avons passé un très bon séjour en famille. Agreeable Landlord with the sea at the horizon. We had a summer stay in 2018 there, two families with 4 adults and six children in total. Its our fourth stay in the larger area. Cherreuiex is perfect for trips to well known Breton tourist attractions (Cancale, St. Malo, Dinan and Dinard) as for visiting Mt. Saint Michel. A nice village with not too much touristic influence and the typical french artisan shops like Bakery, Butchery and the like. The sea however ist most of the times a 30 minutes walk away from the shoreline, and usually it ist muddy. Technically, the house is at the sea, practically it's not. Old Breton Stone House with charm. Enough space for ten people. Internet connection is laughable, but that seems to be endemic for Brittany Beautiful entrenched garden with enough room for games like Volleyball or Speedminton. There are however considerable signs of water damage of the past at the house. Bathrooms are ok, we decided to change the shower-head ourselves to avoid discussions. Kitchen and dining room are nice, roomy and well equipped. The DVD player did not work - this as well as the the internet connection problem - seems to be the usual state of things in the places we encountered.. The Landlord was helpful and agreeable, ready to assist at any level. However, as with most people in the region, he solely speaks french. Regardless, there was always a way to communicate efficiently with him. L'accueil était ok. La maison ok. Il faudrait des toilettes à l´étage. Beaucoup d'humidité. Les prix des draps, serviettes et ménage trop élevés pour les prestations. 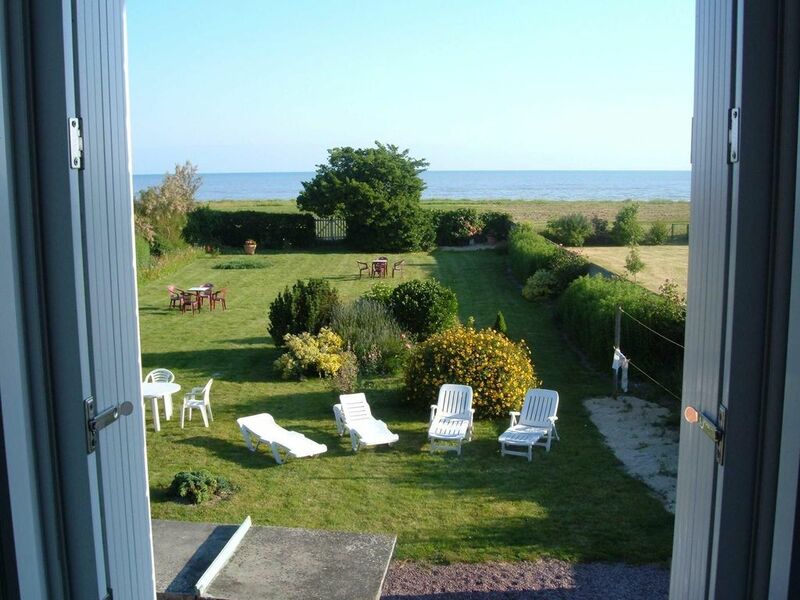 The house has a fantastic garden, from which you can walk straight onto the beach. You must realise however, that this is the beach of a bay ("Mont Saint-Michel Bay" of "Baie du mont Saint-Michel") and not a "sea beach". This means that, even at high tide, the sea can be 1 kilometre away. At low tide, it may be several kilometres away. So the sea may be MUCH further away than the picture suggests (depending on the time of the year you are there). The house itself is nice and clean, but the living room is rather small. Everything is a bit old-fashioned: cable tv, but no dvd player and a wifi signal that is very weak. So if the weather is nice, the house is a fantastic "base camp": you can spend time in the garden, stroll on the beach and go out to the Mont Saint-Michel, to Saint-Malo, to Cancale etc. By rainy weather, however, the house does not really offer the comfort a large group needs. villa campagnarde en bord de mer, équipée de tout le nécessaire, jardin très agréable avec les enfants, point de chute idéal pour la découverte de la baie du mont, propriétaires très chaleureux et accueillants, à conseiller en famille!!!! Cherrueix (35) huis met bloemen tuin met uitzicht op de baai. Le solde du payement se fait à votre arrivée. La consommation d'électricité est a régler à la fin du séjour.